The creaminess in this soup comes from a couple of handfuls of cashew nuts, thrown into the roasting tin with the tomatoes. Once puréed, the result is rich and sumptuous. The riper your tomatoes the better – but roasting will sweeten and intensify even less than perfect specimens. Cut the tomatoes in half and put them in a large roasting tray – they should fit fairly snugly. Scatter over the chopped garlic, trickle over the oil and season generously with salt and pepper. Roast for 25 minutes, then scatter the cashews over the tomatoes. Return to the oven for a further 20 minutes until the tomatoes are soft and pulpy and perhaps a little charred in places. Scrape the tomatoes, cashews and all the garlicky pan juices into a blender. Add the stock or water and blitz to a purée. Pass this through a sieve, which will remove any pips, or stubborn bits of tomato skin. When you’re ready to serve, reheat gently. You can add a little water if the soup seems very thick or the flavour is too intense. Season with more salt and pepper if needed, and add a pinch of sugar if you think the tomatoey acidity needs tempering slightly. Ladle into warmed bowls and finish with a swirl of extra virgin oil, plus a few chopped cashews and a dusting of paprika if you like, and a generous sprinkling of pepper. 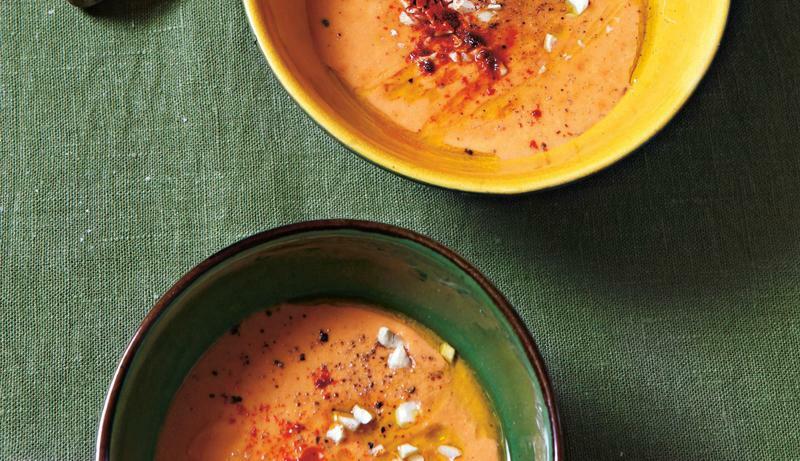 Chilled version: this soup is also very good served cold. Chill in the fridge for a couple of hours, then finish it off with plenty of shredded fresh basil or mint leaves.